Wiley Post became the first to fly solo around the world and set a record for speed when he landed his Lockheed Vega Winnie Mae at Floyd Bennett Field, Long Island, New York on July 22, 1933, where he started 7 days, 18 hours, 49 minutes, 20 seconds earlier. This photo shows him standing in front of his Winnie Mae. Wiley Post's Winnie Mae being installed in the new Time and Navigation gallery at the Museum in Washington, DC. The fuselage of Wiley Post's Winnie Mae being lifted by crane to the second floor of the National Air and Space Museum in Washington, DC, for installation in the new Time and Navigation exhibit, currently under construction. The wing of Wiley Post's Winnie Mae being lifted by crane to the second floor of the National Air and Space Museum in Washington, DC for installation in the new Time and Navigation exhibit, currently under construction. Time and Navigation - "Winnie Mae"
“Time and Navigation: The Untold Story of Getting from Here to There” opens April 12, 2013 at the National Air and Space Museum. Lockheed Vega "Winnie Mae" on display in "Time and Navigation"
The Smithsonian Institution acquired Post’s Lockheed Vega 5C Winnie Mae through an act of Congress that authorized funds to acquire it from his widow. The aircraft is currently on display in the museum’s “Time and Navigation” exhibit. Wiley Post’s Winnie Mae circled the globe two times, shattering previous records. The first time was in 1931 with Weems associate Harold Gatty as lead navigator. The second was a solo flight in 1933 assisted by “Mechanical Mike,” one of the world’s first practical autopilots. This artifact will go on display in the Time and Navigation exhibition, scheduled to open at the National Air and Space Museum in 2013. Wiley Post flew his Winnie Mae around the world July 15-22, 1933, becoming the first person to do so solo. Panoramic view inside the Lockheed Vega Winnie Mae. Flying this specially modified Lockheed 5C Vega, famed aviator Wiley Post set many records and pioneered several aviation technologies. In 1931 Post and navigator Harold Gatty flew it around the world in eight days, and in 1933 Post became the first to fly around the world solo, taking only seven days. In 1935, while wearing the world's first pressure suit, which he helped design, Post flew the Vega into the stratosphere, reaching 547 kilometers (340 miles) per hour while cruising in the jet stream. The Winnie Mae was named for the daughter of F. C. Hall, the original owner and a close friend of Post. Designed by John K. "Jack" Northrop, the Lockheed Vega first flew in 1927. It was the first aircraft with the NACA cowl, which streamlined the airflow around and through the engine. This decreased drag and increased power plant cooling. 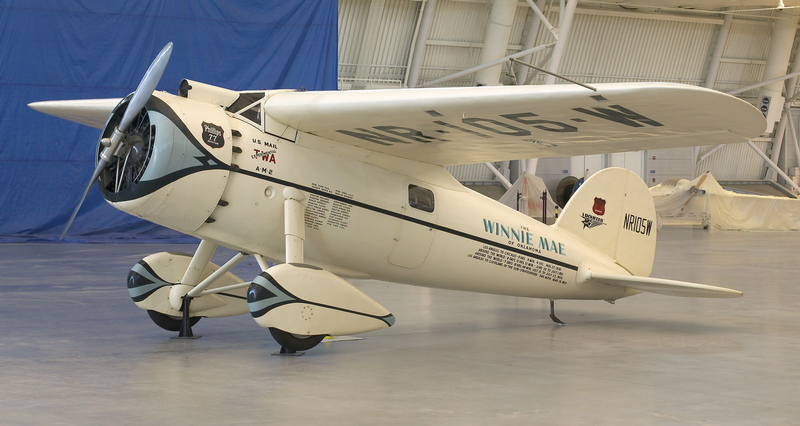 The Winnie Mae, a special Lockheed Model 5C Vega flown by famed aviator Wiley Post, completed two around-the-world record flights and a series of special high-altitude substratospheric research flights. It was named for the daughter of its original owner, F. C. Hall, who hired Post to pilot the plane, which had been purchased in June 1930. On June 23, 1931, Post, accompanied by Harold Gatty as navigator, took off from New York to make a world circuit in record time. The first stop was Harbor Grace, Newfoundland. From there, the fourteen-stop course included England, Germany, Russia, Siberia, Alaska, Canada, thence to Cleveland, and finally to New York on July 1, 1931. The circuit was completed in 8 days, 15 hours, and 51 minutes. Halls admiration for his pilot manifested itself in the gift of the Winnie Mae to Post. Wiley Post spent the following year exhibiting the plane and conducting various flight tests. The airplane was groomed with an overhaul of the engine, and a radio compass and an auto pilot were installed. Both these instruments were at the time in their final stages of development by the Army and Sperry Gyroscope Company. On July 15, 1933, Post left New York. Closely following his former route but making only eleven stops, he made a 15,596-mile circuit of the earth in 7 days, 18 hours, and 49 minutes. Post next modified the Winnie Mae for long-distance, high-altitude operation. He recognized the need to develop some means of enabling the pilot to operate in a cabin atmosphere of greater density than the outside atmospheric environment. Because of its design, the Winnie Mae could not be equipped with a pressure cabin. Post therefore asked the B. F. Goodrich Company to assist him in developing a full pressure suit for the pilot. Post hoped that by equipping the plane with an engine supercharger and a special jettisonable landing gear, and himself with a pressure suit, he could cruise for long distances at high altitude in the jetstream. On March 15, 1935, Post flew from Burbank, California, to Cleveland, Ohio, a distance of 2,035 miles, in 7 hours, 19 minutes. At times, the Winnie Mae attained a ground speed of 340 mph, indicating that the airplane was indeed operating in the jetstream. Wiley Post died shortly afterward in the crash of a hybrid Lockheed Orion-Sirius floatplane near Point Barrow, Alaska, on August 15, 1935. His companion, humorist Will Rogers, also perished in the accident. The Smithsonian Institution acquired the Winnie Mae from Mrs. Post in 1936. During its high-altitude flight research, the Winnie Mae made use of a special tubular steel landing gear developed by Lockheed engineers Clarence L. Kelly’ Johnson and James Gerschler. It was released after takeoff by the pilot using a cockpit lever, thus reducing the total drag of the plane and eliminating its weight. The Winnie Mae would then continue on its flight and land on a special metal-covered spruce landing skid glued to the fuselage. During these flights, Post wore a special pressure suit, the world’s first practical pressure suit and an important step on the road to space. The suit was the third type developed by Post and Russell S. Colley of B. F. Goodrich Company. It consisted of three layers: long underwear. an inner black rubber air pressure bladder, and an outer cloth contoured suit. A special pressure helmet was then bolted on the suit. It had a removable faceplate that Post could seal when he reached a height of 17,000 feet. The helmet had a special breathing oxygen system and could accommodate earphones and a throat microphone. The suit could withstand an internal pressure of 7 psi. Bandolera-type cords prevented the helmet from rising as the suit was pressurized. A liquid oxygen container, consisting of a double-walled vacuum bottle, utilized the natural "boil off" tendencies of supercold liquid oxygen to furnish gaseous oxygen for suit pressurization and breathing purposes. This early full pressure suit is the direct ancestor of full pressure suits used on the X-15 research airplane and manned space voyages. The Winnie Mae, its special jettisonable landing gear, and Post’s pressure suit are in the collection of the National Air and Space Museum. Wiley Post set a number of records in the Winnie Mae, a Lockheed Vega. He and his navigator flew around the world in eight days. Then, he took the same trip by himself and took seven days. Post also worked with BFGoodrich to develop the world’s first pressure suit in order to fly above 50,000 feet and set more records. High wing cantilevered monoplane with monocoque fuselage, fixed landing gear, ground adjustable propeller.